A second transnational meeting to end the first school-year! 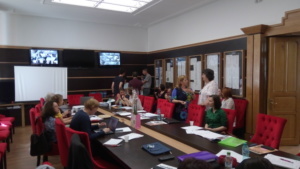 25 teachers representing the 10 partner schools (+ 2 invited ones) and the MATh.en.JEANS association gathered on the 31st of May and 1st of June in the Colegiul Naţional Iași (Romania). 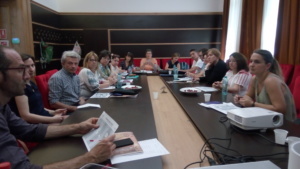 This second transnational meeting ended the first school-year of Maths&Languages and was the opportunity to review all the activities of the project in 2017-2018. In short, the physical meetings between twinned teams (LTTAs*) were very much appreciated by students, teachers and researcher as well as joint participations to congresses (in France or in Padova, Italy). There is more work to be done to harmonise maths research and communication practices and to fix technical issues but everything is running well! 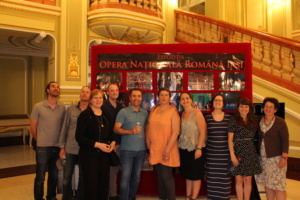 The atmosphere was good and the group looks forward to meeting again in Warsaw for the 3rd transnational meeting (27th-28th of September)! 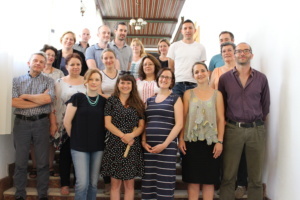 PS: It should be noted that the M&L partners were pleased to welcome two new schools that are using the M&L approach: Lycée Bellevue (Alès, France) and Colegiul Naţional Mihail Eminescu (Satu Mare, Romania)! * Learning, Teaching and Training Activities. Article précédentThe first M&L year is ending… what did pupils think about it?